One of the first things I began to do was chart my cycle. This exercise was wearisome and frustrating at times. Yet, it showed me that I was ovulating later than I thought and that the second half of my cycle – the luteal phase – was too short for a healthy conception. I also knew that I had decreased sexual pleasure. Next, I needed to know why my cycle was out of sync, and what I could do naturally to help to repair it. I thought back to my nursing days. I nursed my first born two years and my second born two years and four months. (The second born didn’t want to give up.) While nursing my second born, our family underwent one stressful and emotional situation after another. I ate a healthy diet, exercised daily, and worked hard. My weight gradually dropped to the lowest it had ever been as an adult. Although I wasn’t sick, I believe I depleted my body of nutrients. 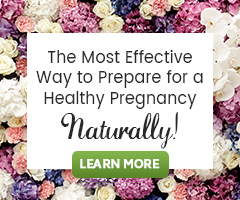 My husband encouraged me to find fertility supplements that would help both of us. (Through a test we had learned that his sperm lacked mobility.) We began taking the following products offered by Natural Fertility: FertiliCare Phase 1 and 2, Vitex liquid extract, and Maca capsules for me; and Male Fertility Cleanse, MH5, and Fertilica Choice Antioxidants for him. I also applied castor oil packs a few times a week depending upon the time of my cycle. For a multi-vitamin, I take Super Mom tablets. (Instead of starting with fertility cleanse, I did fast for about 3 days prior to taking supplements.) Additionally, I experimented with using Emerita progesterone cream in small amounts to try to lengthen my luteal phase with mixed results. We also made dietary changes. In order to increase my protein and good fat amounts, my diet included the following: breakfast – one serving of fruit, a handful of spinach, a hard-boiled egg, 3-6 tablespoons of ground up seeds, and 1/4 cup of plain organic yogurt. (I did seed cycling – http://natural-fertility-info.com/seed-cycling-for-menstrual-cycle.html); lunch – raw fruit and veggies and a type of legume, bean, or high protein grain; supper – a large spinach salad with more ground up seeds, 1/4 of an avocado, virgin olive oil, and vinegar. We would also have meat, casserole, or soup after the salad. I would try to serve fish and chicken at least once a week. We aimed to eat organic meats and eggs, but usually couldn’t afford to buy organic fruits and veggies. We did juice carrots and other veggies once a week. We also decreased the amount of bread, potatoes, and pasta we ate. We still have a sweet tooth. But, we did find a raw, high protein energy ball recipe that everyone liked. Instead of coffee, I enjoyed dandy blend, hot herbal teas, or even blackstrap molasses mixed with hot water, cinnamon, and cream—a little strange, perhaps, but it took the place of the caffeine craving. For about 50 days, my husband also made a concerted effort to lose weight and exercise. After some craziness in my charting cycle (I had one cycle that was over 60 days long, yet I was not pregnant), I saw my luteal phase grow in length. Sexual desire also increased for both of us. My weight increased in a healthy way by 8-10 lbs. Most importantly, we cried out to the Lord for help. We didn’t want to demand another child. But we did want to know His will. If He didn’t want us to have any more children, we desired the peace and contentment that He alone could give. Yet, we felt our desire for another child came from Him. “Lo, children are an heritage of the Lord: and the fruit of the womb is his reward” (Psalm 127:3). We believed He wanted us to wait upon Him. Nearly a year after taking Natural Fertility supplements, we conceived! How excited we were. Unfortunately, we miscarried 8 weeks later. On the very day I miscarried, I also suffered a false accusation that was very devastating. Overwhelmed with grief, false guilt, and anger, I questioned all I felt and did. It took a couple of months to heal emotionally, physically, and spiritually. I did take RecoverWell which did aid the return of my cycle on a regular basis within the first month. After completing that, I resumed the other supplements I had used. God graciously granted us conception again about 4 months after the miscarriage. Although the first trimester was the most difficult I had experienced (very exhausted, nauseous, vomiting daily), the rest of the pregnancy has gone well. I should deliver any day now. We’re having a girl, whom we’ve named Gloria Faith. We do give God glory and thank Him for the faith to trust Him through difficult times. very inspirting and practical. Mostly touched by the most important crying out to Lord. I myself also found a lot of helpful information here in this website. I visited the web often. Thank you Natalia! Thank you Elizabeth and the team!